Like so very many of my neighbors, I may live more-or-less in Washington DC now, but I'm not really "from" here. I relocated from points north in 2008, for a promising relationship and a good job. (Both of which, happily, worked out well.) That's four years now that I've lived here, though, and my mental map of the area still has a shameful amount of black fog over it. I know my own neighborhood fairly well, of course. I can find all the shops and businesses I need, and I've got far too much familiarity with every possible route to our regular mechanic's shop. I learned the area around where I used to work—well, all the lunch places around it, at any rate. And, like any resident of our nation's capital, I've learned the stretch of city full of museums and historical government buildings quite well from playing tour guide to every friend and family member who comes to visit. And yet, four years' worth of errands and targeted outings have left my knowledge of the city fairly weak. 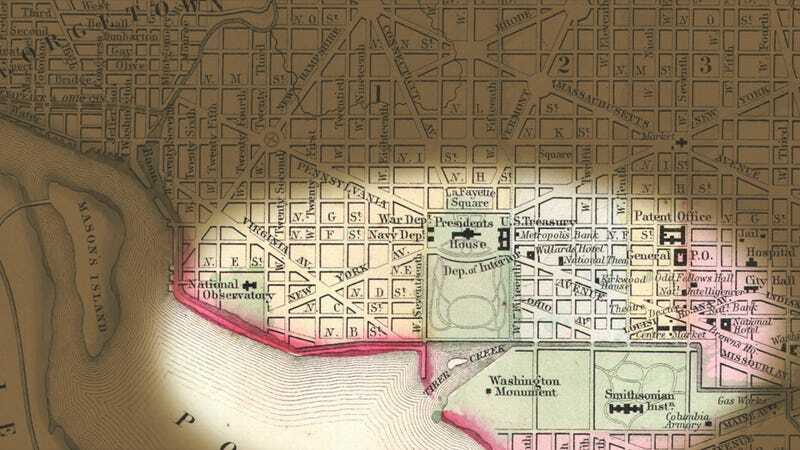 The same way a map in an open-world game becomes a series of visible dots amid a sea of unexplored territory, my mental map of DC has visibility for a few blocks around most Metro stations, and seas that may as well be marked "here there be dragons." Without a reason to go exploring—without an errand or a meeting presenting like a quest—I hadn't taken the time to wander the wilds and see what happened. So yesterday, on a gorgeous fall day, I accepted a quest that would take me into uncharted lands. Or, at the very least, unfamiliar city blocks. We had purchased a session with Stray Boots through one of the many daily deal sites. The premise of Stray Boots is that you register a mobile phone number with your ticket, and you then receive clues through either text message or web browser. When you text back a correct answer, you receive your points and the next clue. Our adventures began on an anonymous residential block in Georgetown, where we were instructed to look for something that "makes waves." We found a mural inspired by The Great Wave off Kanagawa, texted in our answer (the name of the painter), and from there, we were off. I learned that during the Civil War, the canal that still runs parallel to the Potomac had 74 locks in it. I learned where Nixon liked to eat lunch. I saw the oldest building in DC, a stone house from the 18th century, and popped in at a couple of cupcakeries along the route to taste-test the wares. I learned that "an old brick building with metal stars on it" describes almost every building south of M Street for about four blocks, and that one long-standing local business had unexpectedly relocated to Los Angeles since the last time our treasure hunt was updated. And like any good players, we reported the missing landmark, albeit with a phone call instead of a /bug command. Is it the dreaded "gamification" that got me to explore my own backyard? Maybe. But with so many destinations in an urban space, it's hard to know which ones to pick without a little extra guidance, sometimes. Turning exploration into a game triggered the same instinct in me that made me explore every square inch of the fake DC in Fallout 3, just to see what I might find. Playing the game made me stop and think of my adoptive city as a map to uncover, just for the joy of seeing what it has to offer. The lovely fall weather should hold out for another couple of months before it gets too cold and icy (and dark) to run around outside. Stray Boots has two more DC scavenger hunts. This will be the year when I finally uncover that map, and stop being ashamed of myself for not even knowing the zones next door. Shame there's no fast-travel in the physical world, though. Moving around by map sure beats moving by Metro.